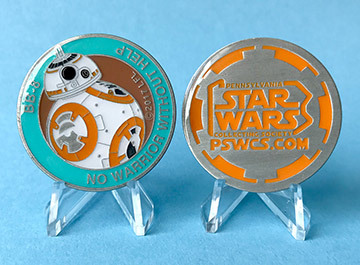 PSWCS.org, in conjunction with the Pennsylvania Star Wars Collecting Society (PSWCS), is proud to offer for sale this BB-8 themed medallion to raise funds to support No Warrior without Help. The limited edition medallion is fully approved by Lucasfilm and has an edition size of 1000 pieces. Each medallion features the likeness of BB-8 on the front, along with the date and the name of the charity, No Warrior without Help. The back features the PSWCS logo.